The wheel wash system removes mud and clay from the wheels and chassis and thoroughly cleans the lower parts of H.G.V. vehicles in one drive through operation. 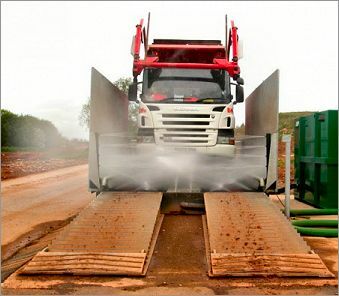 This type of system is ideal for opencast and quarry sites where the removal of dirt such as coal, sand and gravel is imperative before the vehicle re-enters the public road network system. Wheel wash units, jet washing, under chassis washing and vehicle washing units can be tailor made to suit your specific site conditions. Installations are available throughout the UK. A vehicle entering via the entry ramps of the wheel wash system activates inbuilt infra red sensors which initiates the washing process. The vehicle proceeds through the wheel wash system and exits via ramps. This type of system uses recycled water benefitting the environment. A wheel wash can be inset into the ground or surface mounted, using a bath or spray bar. An angled entry and exit ramps at the wash also manipulate the tyres, working off the debris. Wheel wash units are generally sited on a hard level surface usually in near vicinity to the exit of the site. Typically the main storage tank is fed by water from a bowser so no civils or mains services are generally required. A wheel wash unit can be powered by electricity (single or 3 phase) or diesel and optional washing spraybars or a jet wash can be fitted. Under chassis washing systems are also optional. Are you interested in a vehicle washing system?